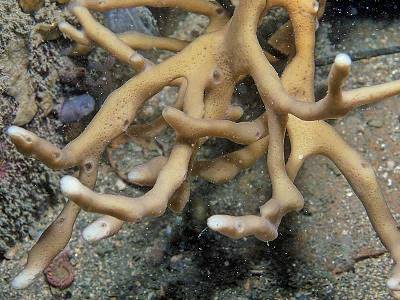 Description: This species of sponge is very polymorphic, it may grow as a thin sheet or cushion or as a branching-repent or branching-erect colony, up to 45cm across. The oscules are regularly scattered along the branches on small mounds. It is usually beige-brown in colour with patches of orange pigment. The boundaries between the colour zones are often sharp, this is a useful diagnostic character. The sponge has a very hard and brittle consistency, almost like that of wood. 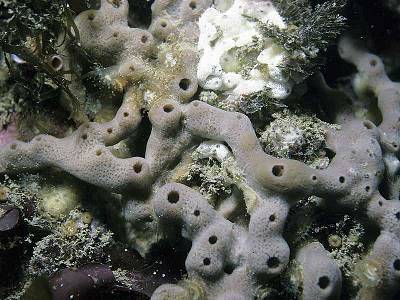 Habitat: The encrusting form of this sponge is common under boulders or overhangs on the low shore and shallow sublittoral. Larger branching colonies occur on bedrock and boulders in areas sheltered from wave action but exposed to moderate to strong tidal streams. Distribution: This species has been recently reported from scattered sites around the Irish coast, and also Anglesey, Devon, Jersey and the Isle of Wight. It is probably more common in the south and west of the British Isles. 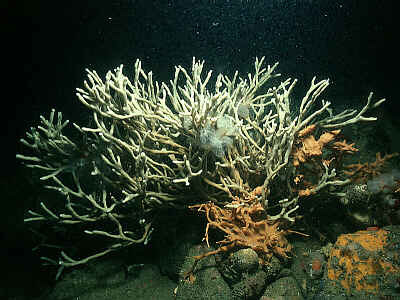 Similar Species: The hard and brittle consistency of this sponge together with a branching-repent or branching-erect structure are fairly distinctive. Picton, B.E. & Morrow, C.C. (2016). Haliclona simulans (Johnston, 1842). [In] Encyclopedia of Marine Life of Britain and Ireland.